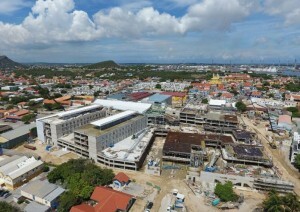 WILLEMSTAD – The expertise of the consultancy Berenschot is no longer needed for the construction of the new hospital in Otrabanda. According to Reginaldo Doran, Director of the Foundation Development Netherlands Antilles (SONA), the project can continue under the supervision of other experts from other company such as AT Osborn. Doran said this during a recent press conference. The reason why SONA ended the work relation with Berenschot is because the consultancy still cannot justify the spending of 3.5 million guilders which was given to them as an advance. Doran stressed that this decision will not affect the progress of the construction project. ‘The construction is on schedule and will eventually not be delayed. We will take a more effective approach,” said the SONA Director. The construction of the new hospital will, as agreed, continue with the same subcontractors and same workers. The companies will not be paid by Berenschot but directly by SONA. For the transition process from the old hospital SEHOS to the new one, SONA has already made arrangements with the management of the SEHOS and the union CBV.